← Books and Movies – Love ’em! House Rules – I’m currently reading this book, after attempting to listen to the audiobook. I was given the book and its heft made it pretty easy to grab the audiobook that was sitting on the shelf at the library, in order to replace my Harry Potter listening time! But, oh! How awful it was to listen to this book, narrated by four individuals, and told at a painfully slow pace. Sometimes I thought the disc must be done but it was simply a pause – between sentences or paragraphs or chapters. No matter. Ugh. So I picked up the book and have been ripping through it! It is a fast read and I’m sure I’ll finish it tonight or in the morning. It’s hard to put down. Isn’t it great when a book grabs you like that? 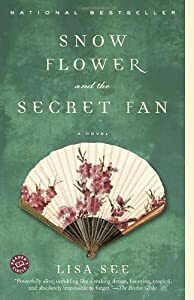 Snow Flower and the Secret Fan – I have loved books about the Far Eastern culture for a long time. Probably at least since I returned from my visit to South Korea, if not before. Lisa See has written some great books about the Chinese culture – in America and coming to America in recent history and in a more historical China. “Snow Flower” ia the first of Lisa’s books to make it to the big screen (I believe I’m right) and I am excited to see it. (I may have to make a trip to the Cities if I want to see it in the theatre! Durn limited releases!) This book is about Snow Flower and Lily, who are matched as laotong or “old sames” as young girls. They communicate to each other mostly through the “women’s language,” nu shu, written on a fan. The match is made so that one girl may rise up and the other may learn the ways of those lower than her. A good read about these two women through their lifespans – one reaches 80 years. I look forward to reading Lisa’s newest book – Dreams of Joy – a sequel to Shanghai Girls. Yay! The Girl in the Garden – Kamala Nair, an author who grew up in Rochester, wrote a charming and sweet story about a girl whose troubled mother brings her to her home village in India for a summer. Now an adult, Rakhee writes the story of the Girl in the Garden to her fiance as she returns to India to obtain resolution for the secrets that she learned as a 10 year old during that fateful summer. I am also fascinated by the mid-Eastern culture and have read a lot of books set in India. This was easy to read and a sweet story. Olive Kitteridge – A book club pick that was lukewarmly received. It was good. Not great. Not gonna be something I will remember a year from now (well, maybe the fun time we had at book club not discussing it will be remembered!). But it was well-written and kept me reading, looking for Olive in the short stories. Second Thyme Around; Stately Pursuits; Highland Fling – These three books by Katie Fforde were light and fluffy and predictable. Good summer fare, but again not great. I think in another post I listed other similar authors that I would recommend before Fforde (Jane Green; Marian Keyes, Maeve Binchy) . Of these three books I would recommend Second Thyme Around as the most interesting. I think I’m about caught up. I will remember this spring/summer as being very full of Harry Potter, and now I’m done talking about that. After I finish House Rules I will pick another book from my ever-growing pile and will let you know what’s next! I encourage you to be my friend on goodreads and let me know what you’re reading! This entry was posted in About Book Blogging, Book Club Books 2011, General Book Talk and tagged Girl in the Garden, Harry Potter, Kamala Nair, Katie Fforde, Lisa See, Shanghai Girls, Shanghai Girls: A Novel, summer reading. Bookmark the permalink.